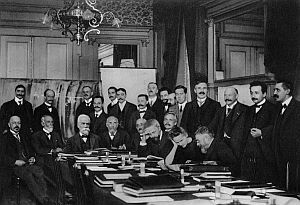 The Solvay conference of 1911 was the first international conference in the history of science. Under the patronage of the Belgian industrialist Ernest Solvay, and chaired by Hendrik Lorentz, it brought together in Brussels the leading physicists of the time for a week-long discussion on the quantum theory of radiation. Lorentz would remain the scientific organizer until his death -- the 1927 Solvay conference on quantum mechanics was the last he chaired. (See a film shot by Irwing Langmuir at that conference, with commentary by Nancy Thorndike Greenspan.) The legendary Bohr-Einstein debate on the probabilistic nature of quantum mechanics started at this 1927 Solvay conference. Seventeen of the 29 attendees would become Nobel laureates. Throughout the first decade, Lorentz remained the energetic and dedicated organizer of the Solvay conferences. He presented Ernest Solvay with a clear program of action: to encourage the study of fundamental questions regarding natural phenomena, work that could be done primarily by individuals but for which "the exchange of ideas among those who practice research is very fruitful" (Lorentz to Solvay, 4 January 1912). Further reading: Special issue of EPJST on "The Early Solvay Councils and the Advent of the Quantum Era" (including a contribution by my colleague Frits Berends on the role of Lorentz). Albert Einstein and Niels Bohr at the 1930 Solvay conference, photographed by Paul Ehrenfest. The Solvay conferences continue. 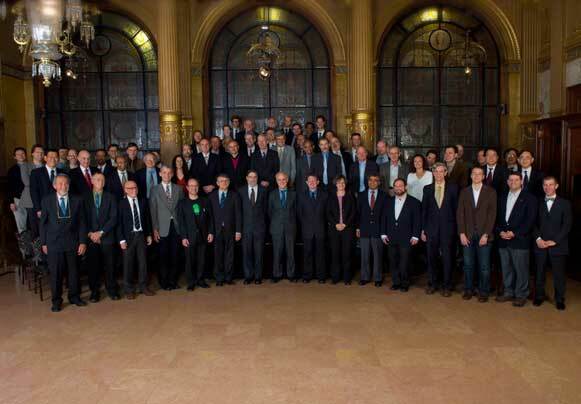 I had the opportunity to attend the 2008 Solvay conference on the "Quantum Theory of Condensed Matter". It was held in the same Hotel Metropole as the first Solvay conference (although the room from the 1911 photograph no longer exists).